According to a fresh survey conducted worldwide it is estimated that Americans spend more than on their pets than the entire defense budget of Germany. This makes this fact pretty obvious that we love our pets fanatically. We take all possible care of them, we build them houses, we take them on walks, we bring them especially processed food. In simple words we go to all extents in taking best care of our pets especially dogs. They are just a member of our family. 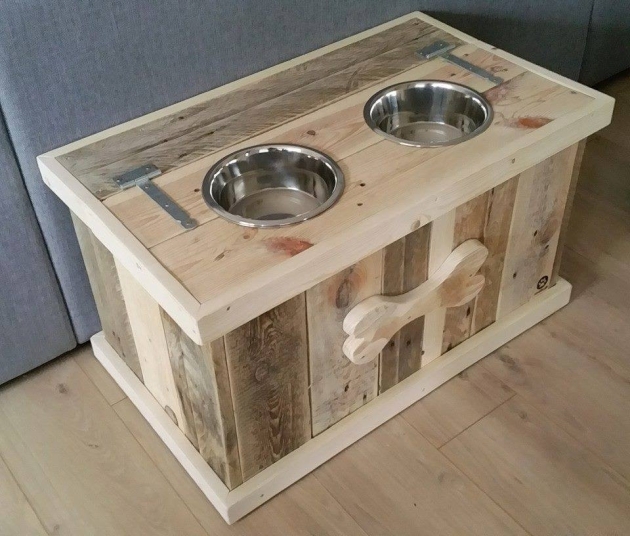 Bearing this in mind we just thought to bring you a wood pallet dog food bowl with storage. Isn’t this a great idea for all the dog lovers? Sure it is. You would literally be desperate to bring this dog food bowl home to make you dog more happy. 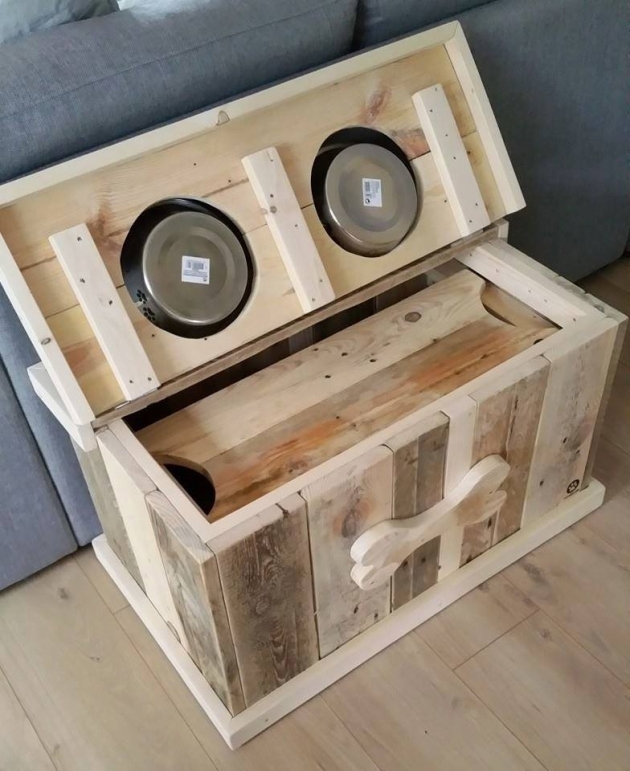 you do not need to worry about your dog’s food, this pallet wood dog food bowl is a specified object meant to feed your dog in a very well manner. Well, apparently this is a mere wooden box. But having a detailed look we realize that it has got a couple of steel bowls fixed inside the pallet wooden dog food box. When we remove the upper lid or cover of the box, we see ample empty space which is pretty good to store a lot of accessories relating to pet dog. While on the front side we see a bone caricature which is a biggest attraction for the dogs. This bone caricature also specifies the box for dogs. Entirely recycled with the wooden pallet, it is left unstained to maintain the rustic look. Place it in the garage or in your patio. Your dog would love to have his food placed inside these metallic bowls. Also use the additional storage space accordingly.